To start an art gallery, you need to understand, and be able to manage and market a business. This includes getting proper business permits by completing state or local business forms. You must take out insurance to cover any public liability and you must obtain a sales tax license to cover the cost of artwork. Like any small business start-up you need to develop a business plan. If you are just starting out, visit as many art galleries as you can and talk to the directors and sales staff. 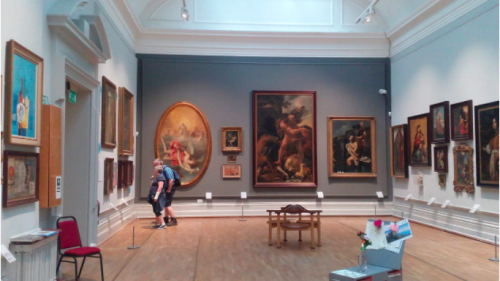 Getting a job in an art gallery will give you first hand experience of how a gallery is operated. Finding a space to hold the art gallery is a creative process in itself. Inquire about vacant buildings, empty shop fronts and old art galleries. Negotiate hard on rent. You will need to renovate it, so build that into your budget. A location close to other cultural businesses such as arts and crafts outlets, theatres, museums or a heavily trafficked tourist area will make it easier to sell the work of local artists. Develop relationships with artists who are diversified. You may find examples of their work in other galleries or online. There are many platforms where artists and collectors share idea and news- Twitter, Facebook, and Deviant Art are helpful places to look. Get recommendations from other art dealers, curators, collectors, and other artists. Other art dealers might know of an artist that does not fit in with their gallery but might be right for yours. Visiting contemporary art museums and student exhibitions is a great way to meet new artists. How long does it take to create any given piece? What are the artist’s career goals? How many other commitments does the artist have? Would these people be attracted to the art? Do these people need the art in any way? Do these people make the decisions about buying art? Do you ever buy art? When you are looking to buy art, how much money do you want to spend? Would you consider yourself an art lover? Ideally you should talk to about 30 people before picking a direction. With the information you’ve gotten from testing your market, you should now be able to tell who is a good fit for your gallery. You are now ready to embark on effective marketing. It is interesting to note the variety of the backgrounds of art gallery owners. Guggenheim always had a passion for art. He started going to museums with his mother when he was just three years old. He was surrounded by painters and collectors. He was looking for a career change and he felt prepared for it because of his artistic upbringing. His perspective is that you don’t need formal education to succeed in the art world. It takes an eye for good art, knowledge and passion. Jessica Silverman is the owner of The Jessica Silverman Gallery in San Francisco. She received her undergraduate degree from an art school. She ended up having more of an interest in engaging with other artists than in her own art practice. She turned her college studio into a gallery, calling it Studio 228 after her room number. She got her graduate degree in Curatorial Practice. She opened her gallery while still a graduate student, which enabled her to move slowly and build a program one artist at a time. She was able to experiment without being under inquisitive eyes and wouldn’t change a thing. Claudia Altman-Siegel is the owner of The Altman Siegel Gallery in San Francisco. Her first paid gig in the art world was as a security guard at New York’s Luhring Augustine Gallery. Her job description was to sit and watch a painting for a month. She was then hired as the registrar and then the co-director in two years time. She ended up relocating to San Francisco and opened the Altman Siegel Gallery in 2009. Although each person has their own story regarding their motivation for owning an art gallery, they all have to seriously consider the steps above. The community of the art world is full of diversity, and is an encouragement for each step of the journey.